SPF >> While a lot of foundations these days already have SPF in them, it is so important to apply an 'individual' SPF also. I love The Body Shop's Skin Defence Multi-Protection Essence, as it is so lightweight and never feels greasy or leaves a white cast over the face - and with SPF 50 it's pretty damn good for you. It's something I use every day anyway, and foundation applies really nicely over top so it almost doubles as a primer! Waterproof mascara >> I'm such an advocate of waterproof mascara all the time, as my lashes just hate holding a curl and it's the only way I can get them to sort-of stay up - until I discovered LVL lash lifts that is. I've had to avoid waterproof mascara as of late because of LVL, but I wanted to bring a waterproof formula with me just in case the ordinary option fails me. Sans lash lift, I particularly love the Maybelline Lash Sensational Waterproof Mascara to hold a curl and stay put on the lashes all day without smudging. I'm planning on sticking to the original formula - but if the heat gets to my lashes then at least I'll have this on hand! Brow gel >> In the same vein, if you're going to apply makeup on holiday then you better make it long lasting. I love Benefit's Gimme Brow Gel for setting brow hairs in place while also adding some colour and dimension to them. I often apply it over Benefit's Ka-Brow! Cream Gel, which I may well do when I'm away, but more realistically I think I'll just apply it itself for some nice natural brows that look a tad better than if I'd left them alone! 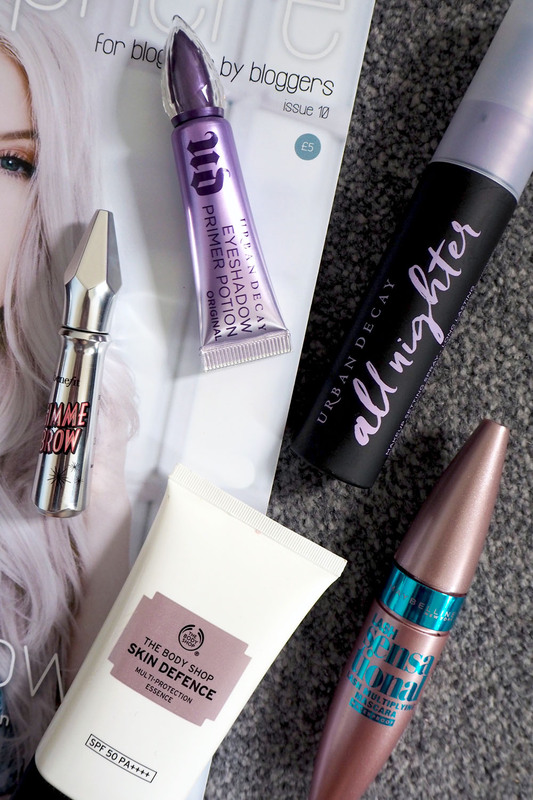 Eyeshadow primer >> Like I said, for those days where you actually want to wear makeup, an eyeshadow primer is a must to keep the makeup on yo' face. I honestly haven't tried many, but I'm happy to take this travel size Urban Decay Primer Potion with me, a primer I've used for a while now. My eyeshadow can crease any old day thanks to my hooded eyelids but it doesn't budge with this one, and I'm sure it will battle the heat too. Setting spray >> I obviously had to pick up the travel size of Urban Decay's All Nighter Makeup Setting Spray. I use it every single day to set my makeup as it blends the mixture of creams and powders into my face seamlessly. However, it's also amazing at helping your makeup cling to your face for longer, and is a nice way to refresh your face in that 'coming back to the hotel then going out for dinner' stage. Like I've said a million times, I don't plan on wearing much makeup on holiday but it's always nice to know whatever I do apply will have a lasting chance!